It the last month of Autumn and it has turned cold, in fact winter cold and it has rained constantly for over a week. Now before I moan too much, I must put this in context, we need rain, in fact we usually need rain, so that is good and the garden is loving it. My problem is that like every autumn I am not ready for winter yet, couldn’t I have a few more sunny days please before it gets cold and grey. 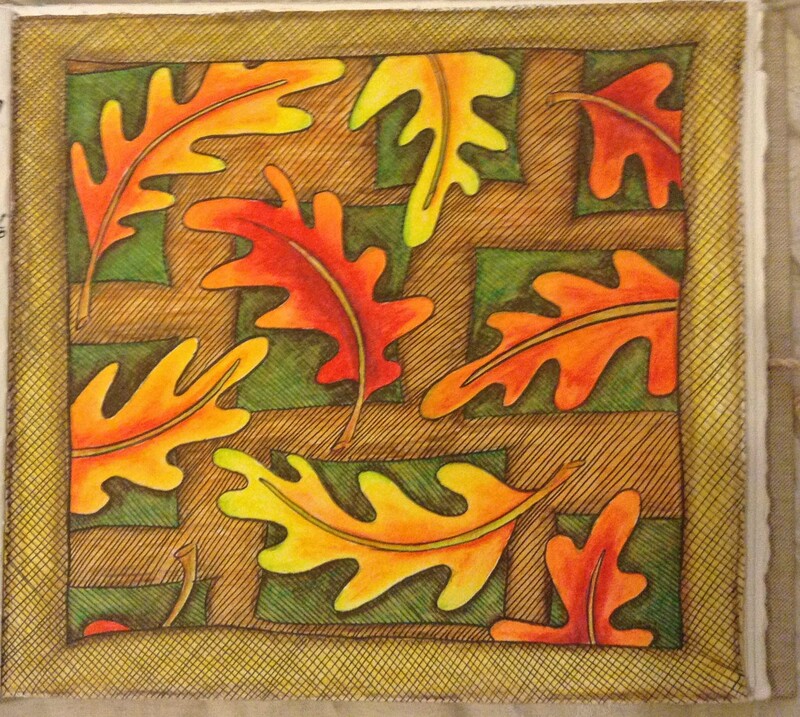 I was inspired to do this pattern by our lovely, huge oak tree that shelters the house we live in. Not a bad effort as it is two stories and the tree covers over half of it. It is somehow really comforting to be embraced by this venerable old tree. It leaves have turned but not all at the same time, some are red but others are still a yellowy-green. I also channelled a little of mid-century design and came up with this pattern, lots of fun. I thought I would get back to the Autumn colours after by spring toned Easter picture. Here is my contribution for April. 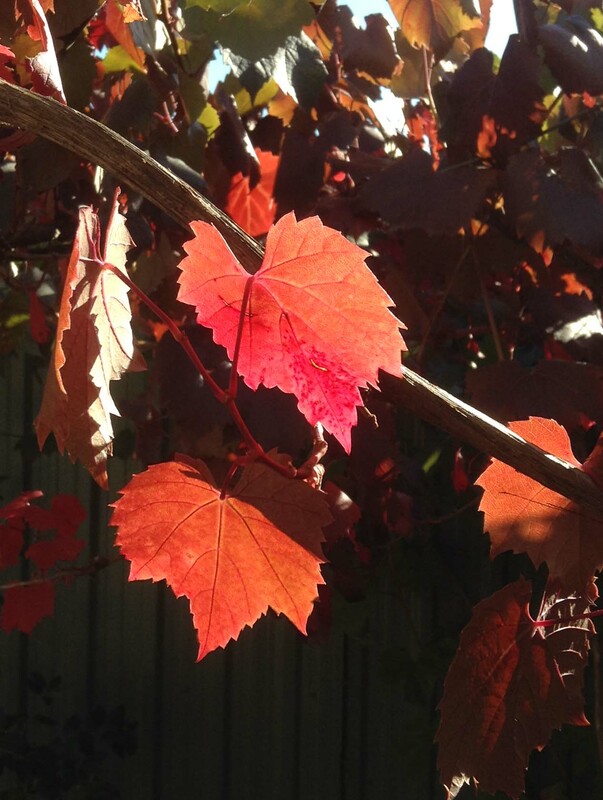 The ornamental grape-vine that shades the my house from the hot north sun, is starting to turn. It is not cold yet and only a few of the leaves turned bright red, the rest are more of a russet-brown. We will need a frost to really get the colours to brighten up. I like the way the grape-vine twines around itself and the grey trunk contrast with the bright red leaves, I have tried to convey the texture of the rough trunk and the smooth leaves, the pattern around it almost give it a medieval feel and the tones are the quintessential autumn colours. Not sure if it needs more work, but as these are supposed to be quick works and have already spent half a day on it, I think I will leave it there. I took a few photos of the sun shiny through the leaves and as one turned out quite well I will share it with you, just realise that I make no claims at being a photographer. These are happy snaps with my iPad.